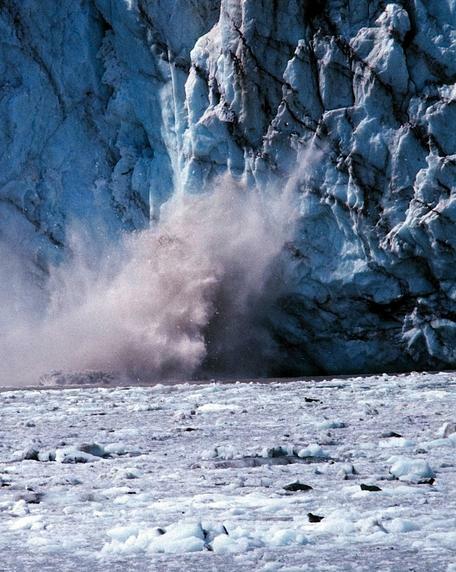 Glacier calving. NOAA Corps, John Bortniak. Topics of sustainability can be intertwined throughout the geoscience curriculum. Geoscience is also uniquely equipped to help with sustainable solutions to many areas effecting our society, such as energy, mineral resources, water, soil, and natural hazards. The InTeGrate project is focused on teaching geoscience in context, with a focus on societal issues and sustainability. Available teaching materials cover range of topics such as water, energy and food. This project has divided its teaching resources into two categories: teaching about climate and teaching about energy. The Toolbook provides teachers with data-based lesson plans and teaching activities that focus on helping students explore the earth system. The goal of this project is to offer laboratory exercises and lesson plans to help improve the high school geoscience curriculum. The Cutting Edge project is dedicated to the professional development of geoscience faculty and improving the geoscience curriculum. The teaching resources collection includes activities, course descriptions, pedagogic approaches, data sets and more across a range of earth science topics. NAGT/AGI co-sponsored textobook that explores Earth systems with a focus on anthropogenic influences. This approach to introductory geology makes the topics relevant to students' lives. Living With Earth: An Introduction to Environmental Geology Hudson, Travis. 2011, Pearson Prentice Hall. The InTeGrate Textbook collection has more geoscience textbooks with a focus on sustainability. In 2012 the InTeGrate project began compiling a list of programs across the country that incorporate sustainability and geoscience. Many programs have been identified and collected, but the list is constantly growing. If you know of a program that should be included, please contribute a program description. AGI is a non-profit alliance of geoscience societies that "provides information and education services to its members, promoting a united voice for the geoscience community." NASA, the USGS and Time have collaborated to make this amazing resource. Search by location to find time-lapse satellite imagery from 1984 to the present. The DOE website has links to many offices and organizations with sustainability resources, including the Offices of Energy Efficiency & Renewable Energy; Environmental Management; Nuclear Energy and all the National Laboratories, including NREL and NETL. The EPA's resources on Environmental Education pair nicely with many geoscience topics. The USGS has many resources under Environmental Health, Natural Hazards, and Education. Many of the offices under NOAA contain resources related to sustainability, such as the Office of Oceanic and Atmospheric Research, the National Ocean Service and NESDIS. AGU offers professional development and meetings, among other resources for educators. AMS provides continuing education, meetings and publications. GSA has many resources dedicated to improving geoscience education, and their annual meeting attracts thousands of geoscientists each year. The CLEAN Network (formerly Climate Literacy Network) is an informal group engaged in fostering Climate Literacy. View the archive or join the email list to hear thoughts from concerned scientists, educators, policy makers, and more. NAGT "works to raise the quality of and emphasis on teaching the geosciences at all levels. We count among our members K-12 teachers and college and university faculty as well as educators working with the general public through outlets such as museums and science centers." NAGT also publishes the Journal of Geoscience Education.